Research data have become scholarly objects in their own right, to be released, shared, and reused. “Data publishing” has become a popular metaphor for dissemination activities. While metaphors can provide useful analogies, they also can be misleading. This one is particularly problematic because it equates research data with publications such as journal articles. Journal articles are a genre that evolved over a period of several centuries as a way to make scholarly arguments, whereas data are the evidence that support those arguments. Efforts to transfer publication practices such as bibliographic citation and altmetrics to data are based on risky assumptions about “data publication” that obscure the substantial differences in incentives and infrastructure. 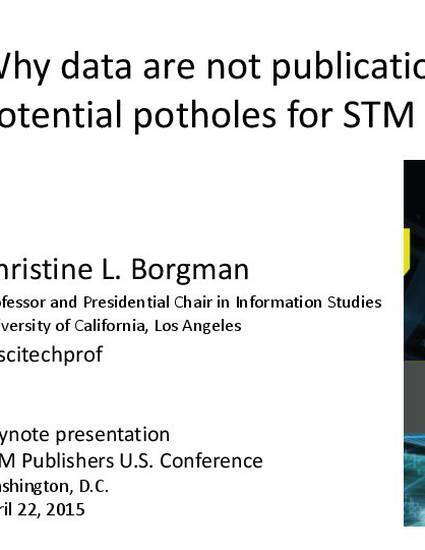 This talk, based on the book, Big Data, Little Data, No Data: Scholarship in the Networked World, will explore the role of data in scholarly communication and the implications for STM publishing.